Andrea and Andrew live in a landscape dominated by massive redwood trees. 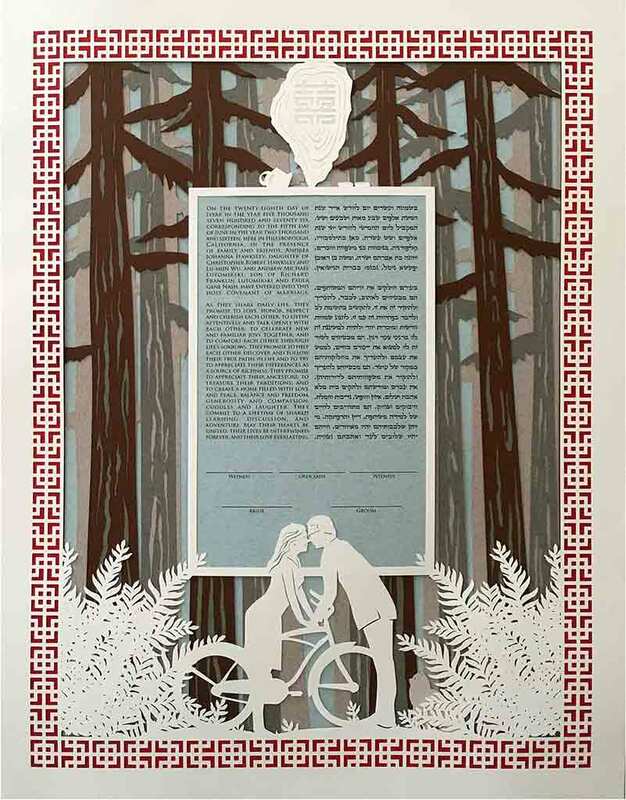 Because of the impact of their surroundings, it made sense that they wanted their custom ketubah with trees. The scale of redwood forests is hard to grasp, but this was clearly something that they wanted to emphasize in a custom design. Admittedly, this meant that I had to do some research since I’ve never actually seen a redwood. It quickly became clear that the trees would have to be stylized down to their basic shapes. When I made my preparatory sketches, they told me that the scale was all wrong. The branches are nowhere near as low as I originally had them, and the trunks are wider than I could even imagine. From a design standpoint, to keep the trees realistic, and maintain the portrait of the couple I would have only been able to fit one single tree trunk! I opted instead to present a forest during the golden hour. An earlier draft of the design included sun rays coming in or bursting out from the back. I indicated them with a sheet of metallic gold so that it would reflect actual light. Sometimes, though, it is better to simplify things down to the most important elements. I included several details that were very meaningful to them. 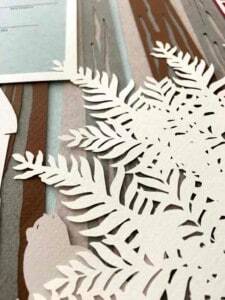 The design ended up being large and heavy with many layers giving it a massive feel that isn’t common for paper cut art. Working on a one on one basis as I do when I create a bespoke ketubah I get to learn lots of small and insignificant facts, that are nonetheless very interesting. When I was working on the sense of scale of the trees, I originally had two tiny deer between the trees in the center. They were tiny and you could just make them out behind the back trees, below where the bicycle wheel is. It actually helped describe the sheer massive size of the trees in a very concrete and literal way — here are some 2000 lbs creatures that look like mice in the distance when compared to the trees around them. But Andrea let me know that deer are actually a pest where they live. They are constantly trying to shoo them from their garden. They really, really didn’t want any deer on their ketubah. It makes perfect sense. I grew up and lived in cities my entire life, so this was something I never thought about before and it gave me some insight on their day to day life. I got rid of the deer in the design. In the close-up we can see how I constructed the layers of trees to work with each other. Each layer interacts with the layer beneath it, creating a unified effect. Another detail to note is the border. Andrea is an artist as well. She works with mathematical art and creates marvelous designs using advanced geometry and iterative algorithms. The border is one of the designs she created. It is based on a Hilbert curve, which is, by definition a continuous space filling fractal and is named after a mathematician named David Hilbert who first theorized it. Andrea had knitted an afghan with this design and I took the pattern and expanded it out into a border element. 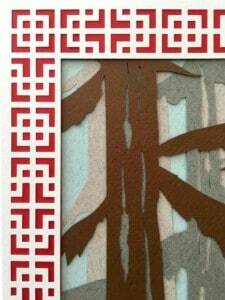 Another thing that made it perfect for this design is how similar it looks to Chinese panel ornamentation. Since Andrea wanted to honor her Asian heritage, we set it with the traditional red color of the Chinese paper cutting tradition, along with a symbol above the text that means “double happiness”, which is often used in celebrations. 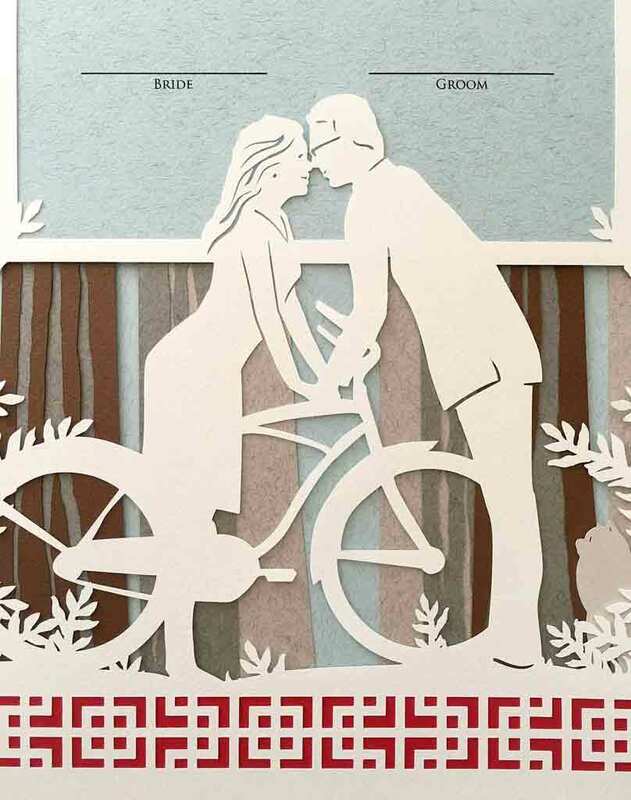 Beneath the text I included a portrait of the couple standing over their bicycle. I actually had them pose with the actual bike they stood over the first time they shared a kiss. I never met them in person, but I worked with Andrea to make sure their relative height was correct and that their basic proportions were right. It is an accurate reconstruction of a meaningful moment in their life. If you look closely behind the ferns you’ll find the cat that lives on their property hanging out, as it often does. You can’t see it in the photos, but the cat is fully formed so if you were to move the ferns aside, you would find an entire papercut of the entire cat’s body in the back layer — even though it is completely unnecessary from a design point of view. I always include small details like these behind the visible layers. It’s an additional amount of detail and work, but I know that people have an innate sense of curiosity and want to move the top layers aside to see how things are constructed. I like to go the extra mile and give them a reward for their curiosity. 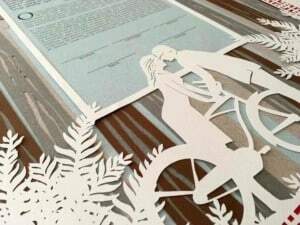 I’m honored that Andrew and Andrea chose me to create their ketubah. 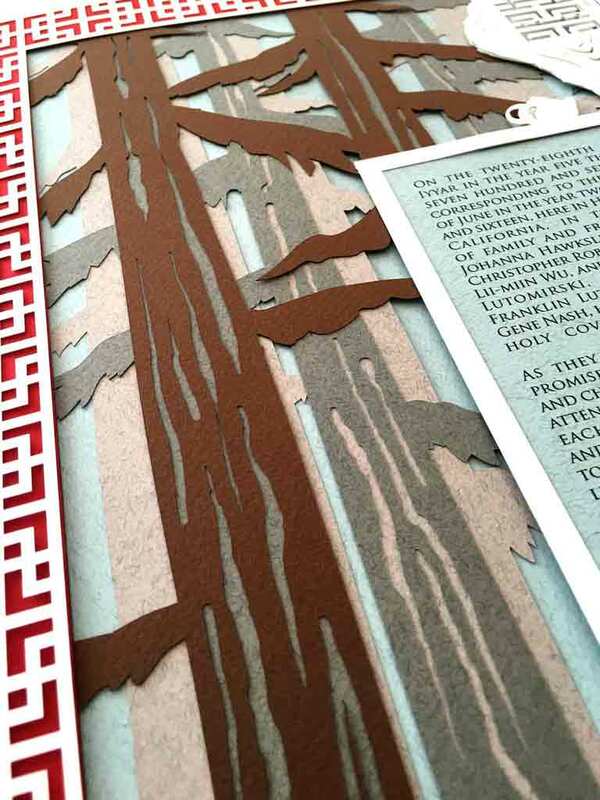 A ketubah with trees is always a pleasure to work on, and this one was such an intricate job with lots of complicated layers, but what really made it so wonderful to work on was the fact that I got to share in their wonderful story and learn so much about them on a personal level. There is a human aspect to doing a custom design that simply cannot be matched.